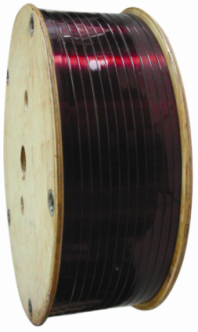 Uncertainty and higher metal cost in copper have raised the need for alternate conductor metal in various electrical applications. Aluminum being the next good conductive material is most popular as replacement of copper. In certain applications like transformer windings this transition is happening rapidly. RR Shramik proudly announcing the addition of Super Enameled Aluminum Strips in the global product range. The manufacturing of bare aluminum strips is critical process, being the soft metal characteristics of aluminum. RR Shramik has most advanced technique machinery to make the aluminum conductors with precision controls in conductor dimensions and better surface properties. At the same time the insulation strength and flexibility has to be excellent to withstand the winding stresses bending / shaping etc. At Salasar Copper, We provide very special attention towards the flexibility and adherence of the insulation film of enameled strips. Stringent test procedures for consistent quality.